I love shark films. Or, rather, I would if there were any good ones other than JAWS. But I was in a sharkey mood last night, so I figured hey...I can watch one of these just long enough to see the first person eaten, right? Wrong. Turns out I found a shark film worth watching all the way to the end! I wasn't expecting much from THE REEF, a low-budget, small cast film about some people lost at sea. Things don't start well either. As the film begins, we're introduced to boring Luke, his boring love interest Kate, and their boring friends, who have gotten together to sail to Indonesia. Along the way they stop at a little island to go snorkling and have awkward conversations about relationships that aren't convincing. After this little interlude, the gang returns to the boat to set sail, only once they're 10 miles out from the island, they scrape bottom and capsize! Now they've got a decision: stay on the boat, in the hopes they see a plane before it sinks; or try to swim to shore, knowing that there are probably sharks out there. Four of the five decide to swim for it. At first it seems like a good decision. Then a dorsal fin appears. Uh-oh...it's shark time! I have to say, THE REEF is surprisingly good. It's not particularly well-acted, and dialogue is as stilted as it gets. But director Andrew Traucki does a great job trying viewers in knots--as it happens, the shark doesn't even show up for ages, but you just know it's out there. When it does appear, it's an actual great white, in all its hideous glory, not some ridiculous looking animatronic or CGI stand-in. The shark just oozes prehistoric malevolence, a soulless killer methodically stalking its prey. The intimate cinematography and a deeply evocative score heighten the tension, which barely lets up to the closing credits. 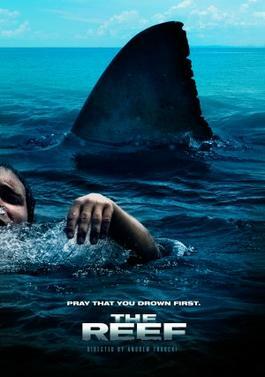 Bottom line, this is a must-see for shark fans, or fans of creature feature horror generally. It's not the second coming of JAWS, but it's one of the the best shark films released since JAWS, even if that's not necessarily saying much. Cult film coefficient: 8/10. I'll definitely be watching this one again.